This plugin stores all icons that your contacts use over time and comes with a viewer for the icons. After installation, the album will slowly fill with icons as your contacts change them. You can open the album viewer with the Contact Album entry in the Window menu and with the View Album entry in the context menu for contacts. Icons can be copied from the album viewer via Drag&Drop. Currently the plug-in comes with English, Dutch, Finnish, French, German, Italian, Polish, Portuguese, Spanish, and Swedish localizations. Further translations are welcome. The version of the plug-in available here requires Mac OS X 10.6 or later and an Intel-Mac. For more info and source code, visit my website. Update UI to look more Lion-ish and resemble the Chat Transcript Viewer from Adium 1.5 more closely. Properly update the image view when a list entry vanishes through deletion of images. Add support for 64-bit Intel builds of Adium (that is, Adium 1.5 compatibility). Drop PPC and Adium 1.3 support. Added Italian translation. Thanks to Bruno Pierini! Added Polish translation. Thanks to Dariusz Jażdżyk! Note that a few strings will still show up in English. For these strings the translation should get inherited from the main Adium bundle (the Chat Transcript Viewer in particular), unfortunately some of them are missing for Polish. Added Spanish translation. Thanks to Ignacio Robles! Added Swedish translation. Many thanks to Valter Kraemer! Adapted to recent API changes on trunk. Added Finnish translation. Thanks to Iiro again. Speed up the initial populating of the album. Thanks to Iiro for testing! One question though, on the initial install it didn't add my contacts' icons until I opened the chat window with them. Do I have to do this everytime or does it automatically update the icon, for example when someone logs in? The plugin relies on Adium sending icon-changed notifications. Adium actually sends too many of those since the plugin is only interested in real server-side icon changes. Getting the first icon for a contact is a special case. Early in development I tried to fetch all icons as soon as an account went online but testing showed that Adium did send notifications for all contacts on the account anyway, so I removed that code. I've tested this with MSN and GTalk, it might be different for other protocols or larger contact lists than I have. May I ask what you use? I'm using both Live (62 contacts) and AIM (74 contacts). So far I'm only seeing the images for 64 contacts, which is the number I've opened the chat window with. Please send me an email (jk@blackdown.de). I'll send you a build which tries to fetch all known icons when an account gets connected. I wonder if it speeds up the initial filling of the album. Look in the "Window" menu, it's right between "Chat Transcript Viewer" and "File Transfers". Alternatively, right-click on a contact, "View Album" is right under "View Chat Transcripts" in that menu. Just FYI, This plug-in causes problems with current Adium Trunk builds. It works just fine on 1.3.3rc1 though. It might have to do with http://trac.adiumx.com/changeset/25886. Thanks for letting me know! I've tested it with the 1.3.3 betas and rc1 but not with recent builds from trunk. I'll upload an update in the next days. 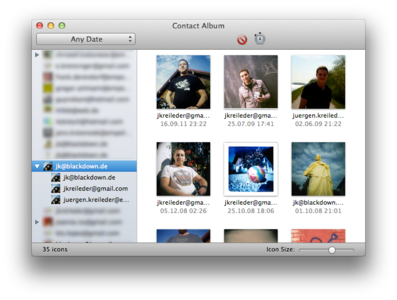 It would be nice if Contact Album would aggregate the images across accounts. For example I have multiple AIM accounts and I have the same contact in both accounts. That contact's aim image shows up twice in Contact Album -- once for each account. Actually the plugin already does this! Unless you found a bug, of course. The key is [contact's service]+[contacts' uid]+[sha1sum of image], your own accounts don't play a role in this. The icons do get stored multiple times if you have the same contact on multiple accounts but only one gets displayed (with the most recent time-stamp). Please check whether the icons are really the same. E.g. by opening them in Preview by double-clicking on them and comparing the file names. If the file names (which are just the sha1 sums) are different, the icons just look similar but are different. If the file names are the same, I'll need a bit more information. Oh, you're right. The duplicates are due to one image being a jpg and one being a gif. I wonder why that happened. I've seen that too. I have no idea what causes it, it comes like that from the purple layer and probably from the server. Has anyone ran into an issue where the stored icons initially reads the actual name of the contact, but then when Adium is restarted the name is changed to some sort of reference number? Other Adium components have the same issue you see, e.g. the Chat Transcript Viewer. There's not much I can do about this from my plugin, it's a problem in the way Adium identifies contacts. I'd rather fix the problem in Adium before doing an ugly work-around in this plugin. Hello, I am in 10.4.11 and was VERY disapointed that the plugin requires 10.5. You miss a large part of adium users with such a limitation. Why ? I like mac but it is a frequent problem with mac software that tehy need the latest version of the OS. It is difficultly understandable. I very rarely have this problem in win32 environments. So Please... (!) could you make the effort to support a few recent releases of MAc OS X ??? I understand that are you disappointed about it. The limitation to Leopard comes from the original aim of the plugin. I started working on this to get a bit into OS X programming (being a UNIX/Linux/Java guy normally), when it came to implementing the viewer part I had to decide whether to write it from scratch or to use the existing infrastructure. I chose the latter, namely IKImageBrowserView. If I find the time I'll look into writing a viewer component that works on Tiger too. Thanks for your understanding. I know time is precious. So many thanks in advance. this is exactly what i did search for for Years ..
this causes on every sync of the idisk houndreds of sync errors ... as idisk not support symlinks ..
any way to bypass that ? Good point, I didn't really expect anybody to use it on a filesystem that doesn't support symbolic links. I'll use another method in the next version. for all having the same isuue ... here is a workarround ..
just execute this before syncing ... no errors occour and the next sync is just as fast as before .. as the syncagent does not recheck all album-directorys every time. however .. there is another issue with albums and the iDisk ... it seems like they getting almost always fully synced wel lat least the current ones i guess. But i have an opinion. Is it possible to see also 'my profile pictures' in contact album? and choosing a 'personal photo' in contact album? You mean like an extended version of the "Recent Pictures" feature Adium already provides? for example rigth click on photo and click 'make personal photo'. Yea, I already thought about this. I'll add it for the next version. Thanks! Good news for me ;) I'm waiting the 'the next version'. very cool i use this to tell who logged in today. easier than looking at a long contact list. would you please upgrade/make it working with Adium v1.5hgr3161 ? many thanks for the great work ! This looks like an amazing plugin, something that I would really love to have! It installed fine and didn't crash Aduim on restart, but it didn't show any icons of my friends/connections. I guess it's because I'm on OS X 10.6... Is there a chance for an upgrade at some point? I don't know what I did, maybe restarted Adium a few times, maybe just got more contacts signing in and out but the album now shows some of my friends' pics, not only mine. This is awesome, thanks for a great plugin! You know, maybe it would be a good addition to be able to assign custom names and group arbitrary contacts in the album. I have, prob. like a lot of people, multiple accounts across a dozen chat networks, and numerous double buddies on each, in other words the same buddy on numerous different accounts/networks. Since the introduction of proxy contact-list entries in Adium, I have given up on trying to combine them into a single contact-list entry since this single contact now shows up in multiple groups in the contact list, since those tend to appear and disappear on a whim. Notable are groups for specific networks like skype. And even better, a grouped account now shows up in the skype group even if skype is not connected, in other words the skype group is still there, only because one of the multiple accounts of that person is connected. Total nightmare! The whole point of grouping a contact was to reduce space in the contact list, and not have them occupy space in 5 different groups. Anyway, since contact list albums seems to take its grouping hints from the contact list, that does not work very well for me anymore.. I would like to be able to do that only in contact list album, and also give a name for contacts to be used when only the ID is available, independent of Adium itself, like you mentioned facebook which only knows nicknames when that spec. buddy is actually connected. An error occurred: Only the submitter, mods and admins are allowed to download Xtras before they are approved. Any way to download the compiled version outside of Adium Xtras' website? One of the admins has to approve the new version. Usually this takes only a few hours but this time the delay seems to be a bit longer. Hope they will approve it soon! Yea, I uploaded 1.1.1 before anyone had approved 1.1.0. If it goes on like this, I'll have 1.2.0 (with some visual updates) ready before 1.1.1 is approved. * Set the environment variable ADIUM to the path to your built Adium tree, e.g: "export ADIUM=/Users/jk/devel/adium"